I have to give a tip of my hat to the fans of Iowa State University. In all my years Downtown I have never seen fans of a team turn out to support them for the Liberty Bowl the way the Cyclones fans have this year – not even my Arkansas Razorbacks, who have a reputation for traveling well, and not even Ole Miss, only an hour away. When I got out yesterday at 11 there was a sea of red and yellow on the Main Street Mall. I did my usual Sunday routine of brunch at the Majestic, then over to the Blind Bear. About 1:30 PM I was getting ready to tab out at the Bear and walk over to the Flying Saucer. Then I started to notice that some of the usual Saucer Sunday afternoon regulars were showing up at the Bear. They advised me not to go over until the Liberty Bowl parade started at 3. Apparently the Saucer was busier at 1:30 on Sunday afternoon than on a typical Saturday night, full of Iowa State fans. Welcome to Memphis, ISU fans, and good luck in your game against Tulsa this afternoon. The Commercial Appeal has published a set of interactive maps that show votes for Obama and Romney in the 2012 presidential election, broken down by precinct for Shelby County. The maps are quite fascinating. My precinct, consisting of the Downtown core south of Poplar and most of South Main, voted for Obama over Romney 65% to 33%. The precinct consisting of Uptown and Mud Island preferred Obama 62% to 37%. As you look east and get farther and farther toward suburbia, the map gets more red, with some Germantown precincts only showing Obama in the teens for percent of vote. One of the blogs I’ve started reading, which I found through a Facebook link, is called If You Can’t Afford to Tip, You Can’t Afford to Go Out and Eat. It’s basically the lives of servers and what they go through working at bars and restaurants. This morning they posted a hilarious animated image: When the “creepy” customer finds you on Facebook. LOL! I can remember several times where servers have shown me friend requests on their phone, and said, “What do I do, Paul? He comes in here four or five times a week so I can’t be rude to him. But the thought of him seeing where I check in, seeing who my friends are, looking at my photos… ewwwww!” I guess this is a case where Google+ is better than Facebook. You can put those people in a circle where you don’t share anything but the most basic, mundane stuff. If you’re looking for stuff to do tonight, here are links to Kerry’s blog post and the Memphis Flyer list of events for New Year’s Eve. Oh and there’s also the Downtown Memphis Events page. As for me, I’m a lot more interested in being out at the bars on 5 PM on New Year’s than I am at 12 AM. I’m off today, so I’m going to head to the Saucer about 2 to watch the Grizzlies. They have an away game at the Pacers. If I don’t post again before midnight, happy new year everyone. Many people in the South believe that eating a bowl of black-eyed peas on New Year’s Day will bring good luck in the coming year. What if you’re not a fan of cooking, though? Where can you go to get your good luck? In addition, the market is going to start opening Saturdays (beginning in the new year) at 8 AM and will serve brunch until 3 PM. Trolley Stop Market is in the 700 block of Madison and is accessible via the Madison Avenue trolley line. If other restaurants are serving black-eyed peas on New Year’s, shoot me an email at paul@paulryburn.com and I’ll make an updated list. Tonight marks the first of three nights of basketball at the FedExForum. The Memphis Tigers host Oral Roberts tonight. Tomorrow the Grizzlies host the Denver Nuggets, and Sunday’s game will be the Tigers vs. Loyola. All three games have a 7 PM tip-off. It’s the last Friday of the month, and that means it’s South Main Trolley Tour night. Many of the businesses in the South Main district will be open from 6 to 9 tonight. Some businesses will offer free beer, wine, and/or hors d’oeuvres. (Free food? Wonder if the Nuh-Uh Girl will show up.) There will also be live music in some of the boutiques and restaurants. The Rendezvous will be closed from January 1st through the 9th. If you get hungry for ribs or BBQ in any other form, here’s a pro tip. Head south on Second. When Second forks off south of Vance, take the right fork onto St. Martin Street. Keep going a couple of blocks south to Butler, and you’ll be at the Downtown Central BBQ location, home of the best BBQ in the city. Once you’ve had Central, you won’t care whether the Rendezvous is open or not. Memphis will be on CBS This Morning Saturday tomorrow morning. There will be a segment featuring different cities’ New Year’s Eve celebrations and celebratory drops. The Hard Rock Cafe’s guitar drop on Beale Street will be among them. There will be a “polar bear plunge” and chili cook-off on Mud Island February 2 to benefit the Special Olympics. Action News 5 has the details. That’s the news for now. Time for some mediocre Chinese buffet sushi, a few more hours at work, and then another four-day weekend. I’ll hit the Saucer about 7 after the Tigers pre-game crowd clears out. BREAKING NEWS: Club Crave has been closed by the Environmental Court as a public nuisance. Press conference to be held in front of the club today at 1. Action News 5 will broadcast the press conference. Pic of sign posted on the club’s front door. This is the building formerly known as the Plush Club. Many fights and shootings have happened in the vicinity of the club over the years. Liberty Bowl events get into full swing beginning today. Tonight there’s a team welcome party at 5:30 at AutoZone Park. $25 admission. Of more general interest to Downtown Memphians will be a couple of events Sunday. The Liberty Bowl Parade happens at 3 PM Sunday. I’ve been to it before and it’s bigger and more corporate than parades the locals put together for events like St. Pat’s. I’m not saying it’s better or worse, just different. Insider tip: If you aren’t driving, go to Wet Willie’s and get a Call-a-Cab (super strong fruit punch daiquiri) to drink while you watch the parade. Following the parade there will be a Bash on Beale, starting with a pep rally in Handy Park at 5. Welcome Iowa State and Tulsa fans! If you have questions about what to do Downtown, shoot me an email at paul@paulryburn.com or hit me up on Twitter at @paulryburn. I also do “office hours” at the Flying Saucer at Second and Peabody Place, and will be happy to answer questions. When I’m there you can usually find me standing in the vicinity of the glass T-shirt case at the bar. The Harlem Globetrotters will be here January 12. If you want to see them, you can buy discounted tickets on Groupon for the next four days. Double J Smokehouse and Saloon moved their Front Porch Stage. It’s now at the front of the main room, next to the front door, instead of along the side of the room only a couple of feet away from the bar. You can view a photo of it here. Tickets to Soup Sunday are on sale now. Soup Sunday is a fundraiser for Youth Villages. Attendees walk around the FedExForum lobby and sample soup and other goodies from about 60 Memphis restaurants. The date is February 24. This year food trucks will be added to the mix, and your ticket will also get you into the Lady Tigers home game that afternoon. I’m getting people asking me where to go Downtown for New Year’s Eve. I am absolutely the wrong person to ask. I HATE New Year’s Eve. I hate high cover charges. I hate overcrowded bars. I hate amateurs who can’t hold their liquor. I hate long lines at the bar. I hate long lines for the restrooms. I hate people who try to act like big shots that night. I’m weighing several options for New Year’s Eve, and as of right now “just stay home” looks like the best choice. If I could be The Grinch Who Stole New Year’s Eve, I would. New Year’s Eve is to the bars what Black Friday is to Walmart. So, sorry for the non-answer on the NYE question, but the first rule of blogging is “write about what you love,” and I have no love for New Year’s Eve. Kerry has an excellent post about NYE events that should give you some helpful tips. Also check out The Memphis Flyer’s NYE guide for even more information. Thinking about hitting the South Main area for a while tonight, although I won’t make it in time for poker at Max’s Sports Bar. Time to go grab lunch and celebrate Crave’s closing! I was hoping the perfect winter storm would happen last night. A perfect winter storm is one that doesn’t begin during work hours, and dumps enough snow and ice to close corporate offices, but not enough to close the bars. The temperatures didn’t cooperate, however, and back to work I went this morning. At least I have a 3-day week followed by another 4-day weekend. There will soon be one less Peabody in the corporate chain. Little Rock’s Peabody Hotel will be converted into a Marriott. Beer news: The FuzzyBrew blog has an interview with Drew Barton, who will open the Memphis Made craft brewery in Cooper-Young next year. In the interview, Drew talks about what led him to the point of opening a brewery, how he picked the name and the space, beers he will brew, and Memphis’ potential for more craft breweries to open in the future. Looking forward to tonight, when I’ll make my first visit to the Flying Saucer in almost 48 hours. Will head that way about 6. If the place is busy with people pre-gaming for the Grizzlies (vs. the Philadelphia 76ers at the FedExForum at 7 PM), then I’ll hit the Silly Goose first then relocate to the Saucer once the game starts. Short post today. Not a lot goes on around the holidays. If I hear of anything interesting this afternoon I’ll post after work. Since winter weather will prevent me from getting to Little Rock today, I called my mother and told her what she got for Christmas. Since it was a local purchase, I might as well tell you about it too. Besides, this way she will get to see a photo of her present. 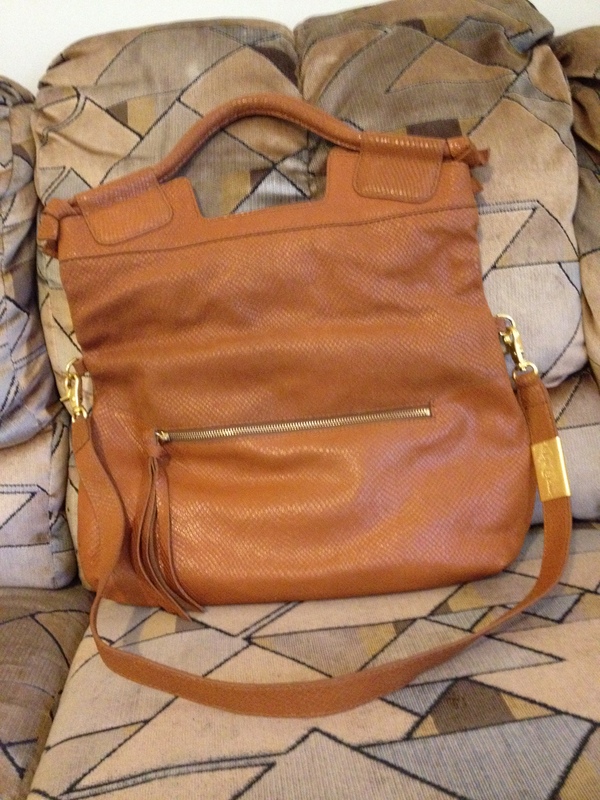 It’s a Foley & Corinna leather purse from Shop Girl New York. When I posted photos of the store’s new Main Street Mall location last month, she commented what a beautiful purse it was. So the following Saturday I went down there and bought it. I will admit I had absolutely no idea what purses cost. Every female I’ve told about the purse purchase asked, “It was more than you thought, wasn’t it?” It was indeed. Still, the purse was considerably cheaper than the iPad that was my mother’s Christmas gift two years ago, so it was within my price range. It’s so easy to find quality Christmas gifts without leaving the 38103. Why not let the suburbanites have Wolfchase and keep your dollars Downtown for Christmas 2013? … And because I represent no company or organization other than myself on this blog, I can say Merry Christmas rather than the more generic “Happy Holidays.” The world has gotten too PC. I remember watching an episode of All in the Family from sometime around 1978. Archie’s grandson Joey got a stuffed panda for Christmas and Archie called it “a chinky bear.” Can’t say stuff like that in 2012. Might offend someone! The big story today is the weather. As of the time I’m writing this (about 9:30 Christmas morning) we are under a Winter Weather Advisory and a Wind Advisory for tonight and tomorrow morning. Estimates of the amount of snow we will get range from “nothing” to “1-3 inches.” However, there is a Blizzard Warning only two counties to the west and north of us, and they have moved the predicted line for heavy snow south in the past 24 hours. Wonder how people are going to run to the grocery stores to stock up on bread and milk, when the grocery stores are closed for Christmas? Anyway, the best place to get your weather information is MemphisWeather.net. Their blog has a summary of the snow predictions for tonight. They also have a very good Twitter account, @memphisweather1, and a good StormWatch+ smartphone app. Due to the weather, I won’t make it over to Little Rock today to visit family. My friends who live in Barton Flats have invited me to come spend Christmas with them. I have to admit, I’m kind of looking forward to seeing what their kids got for Christmas. Gotta remember to save the Downtown gossip that is not kid-friendly for a later time though, which is a shame because there’s some juicy stuff to discuss. Our Mexican friend Mardoqueo is in town and we’re making paella – or rather, he’s making paella while I sit around and drink the PBR I found in my fridge yesterday. 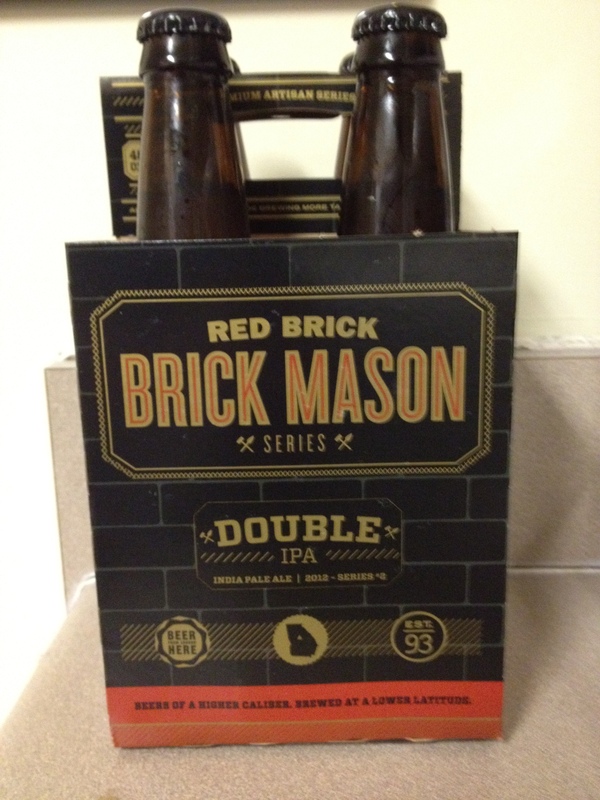 Red Brick Brick Mason Double IPA! Nice! I’ll have one later today. I’ll be out this evening after some of the bars open at 5. Saucer is closed all day, so either Silly Goose or Blind Bear will likely be my first stop. The Blind Bear will have its Tuesday poker game at 8. A lot of the regulars won’t be there, so it could be an opportunity to slip in and score an easy 50 Bear Bucks. That’s all for now. Merry Christmas everyone! I won’t mind at all if this predicted snow moves father south than expected and turns my 4-day weekend into a 5-day weekend. The Silly Goose recently rearranged its menu, adding some new items and deleting some old ones. One of the new menu additions, Goose Eggs, are actually not eggs at all. The picture really doesn’t do this Goose Egg justice. 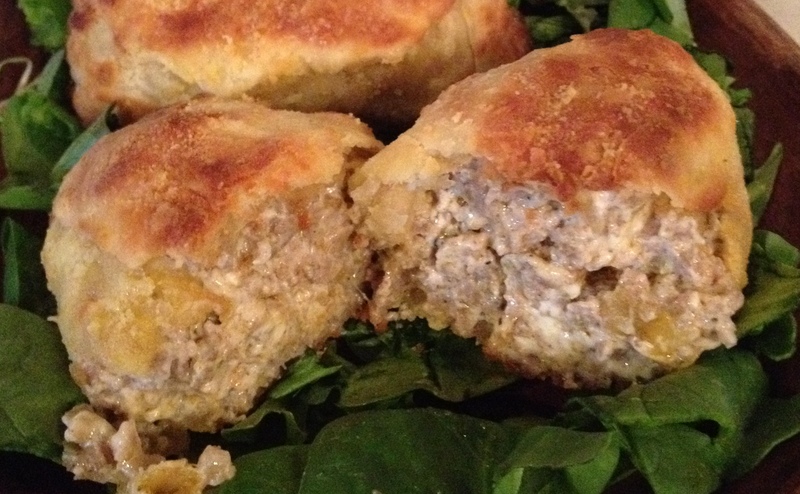 The taste is rich, creamy, sausage-y. The pastry crust is flaky yet strong enough to hold together when you bite into it. I recommend cutting the Goose Eggs in half to eat them, as I did in the pic above. 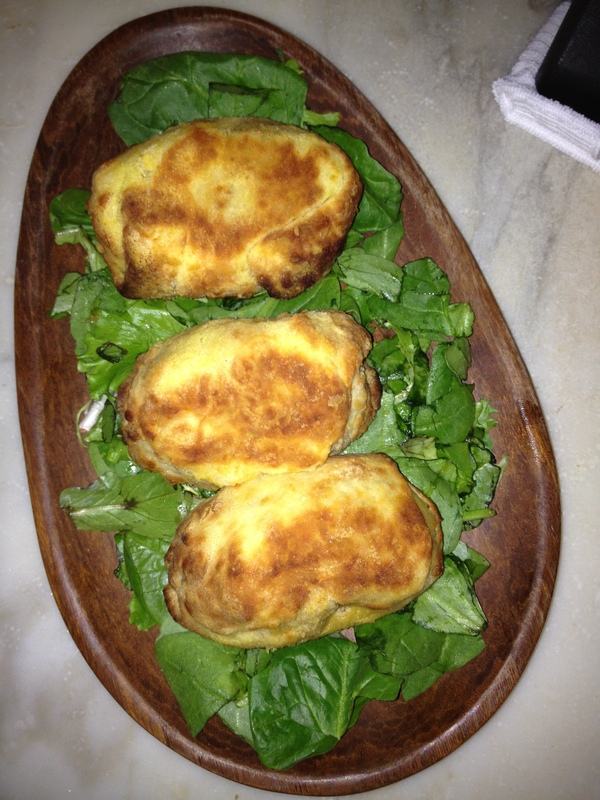 This is one of the best new appetizers I’ve put in my mouth Downtown in quite some time. At under $7, they’re affordable and enough to fill up a person of average-sized appetite. In fact, they were so rich that I couldn’t finish my last half an egg. After staring at it for a few minutes I told bartender Dusty I was giving up and he threw it away. About 10 minutes later, the Nuh-Uh Girl arrived, just barely too late to help out with leftovers. This is seriously a dish I would make a special trip to the Goose for – and, in fact, I did yesterday. I sampled half a Goose Egg off someone’s plate Saturday night. It was so good that when I got hungry yesterday afternoon, I tabbed out down the street and walked over. Meanwhile, the recently-returned Woody A. Long was making himself comfortable on the couch – perhaps a little too comfortable. No poker game tonight, but if I get hungry while I’m out it’s entirely possible I’ll wander over for another order of Goose Eggs. Today will be the end of an era. This afternoon I will go to the Flying Saucer for Pint Nite, check in on Foursquare, and receive bonus points for 180 straight days at the Saucer. It’s my longest streak there ever. There won’t be a 181st day though. The Saucer is closed all day tomorrow for Christmas. Unlike a certain DeSoto County suburbanite, I don’t believe in fake check-ins. If I’m not there, in the business as a customer, I don’t check in. The only exceptions are landmarks like Statue of Elvis that are not businesses. The streak will live on in a sense, though. Because I will hit 180 days at the Saucer today, I will also hit 180 in the more generic Foursquare category of Bars. I will go out somewhere that’s open tomorrow night (we’ll get to that in a moment) and get my 181st consecutive day at Bars. That’s a streak that could easily reach 300 as long as I don’t get sick. All right, let’s get on to Christmas openings and closings. I have more info than I did yesterday, although this is far from a complete list. In general, most restaurants will be closed tomorrow, unless they’re serving a special Christmas dinner. Most but not all bars open around 5 on Christmas. Westy’s and Yao’s Mandarin House are two restaurants you can always count on being open for Christmas. Blind Bear will be open regular hours for Christmas. Bardog will open at 5 for Christmas. Silly Goose will open at 5 for Christmas. Brass Door will be open until 7 today (Christmas Eve) and will be closed for Christmas. Flying Saucer will be open regular hours today and it’s Pint Nite. They will be closed all day tomorrow. Huey’s will be closed all day for Christmas. 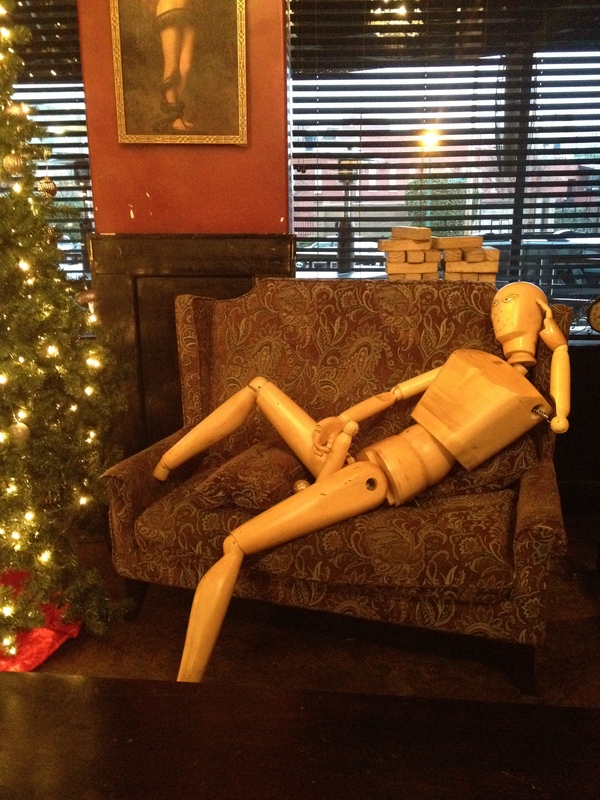 Kooky Canuck will be closed all day Christmas Eve and Christmas. South of Beale will be closed today and will open at 5 for Christmas. Central BBQ will be closed for Christmas. Double J will be closed all day today and the loft bar will open at 5 tomorrow for Christmas. Max’s Sports Bar will be open until 11 tonight and will be closed all day for Christmas. That’s all I have. I’ll be out at Pint Nite at the Saucer mid-afternoon. There’s no poker at the Silly Goose tonight. It looks like snow in Central Arkansas will keep me in Memphis on Tuesday, so I’m compiling a list of what will be open (and when, if opening late) and what will be closed Downtown. If you know of places that will be open or closed, shoot me an email at paul@paulryburn.com, hit me up on Facebook, text me, whatever communication channel you prefer. So far I know that the Blind Bear will have their usual Tuesday night poker game, so I’m assuming they’ll be open at their regular time (5 PM). The Majestic Grille will be closed. The Flying Saucer will be closed all day Christmas, but because Christmas Eve is Pint Nite, they won’t be closing early on the 24th. Feed me info and I’ll try to post an updated list tomorrow.